Home, from far, far away. If you go outside over the next few nights shortly after sunset and look east, you’ll see the waxing gibbous Moon rising. In the twilight you can see quite a few details on its surface with your naked eye. For example, most obvious are dark “seas”—actually called maria, gigantic impact sites that filled with dark basaltic lava. But looking through Earth’s atmosphere limits our view of the Moon, causing the view to boil and waver. Even our largest telescopes can’t see features much smaller than 100 meters or so across. And that’s why we send probes there: to see our nearest neighbor even nearer, and plumb its secrets from up close. In September 2007 the Japanese space agency JAXA sent the SELENE probe to the Moon. Nicknamed Kaguya, it took high-resolution images as it circled the Moon in a polar orbit. Twice a year, the orbit of the spacecraft lined up in such a way that it could see the Earth itself rising above the horizon. It took images so rapidly that a movie could be made from them. JAXA just released a huge set of that data, which contained enough images to make such a movie. So photographer Nicolaus Wegner did just that. The result? Sheer, gorgeous art. Moonshot from Nicolaus Wegner on Vimeo. Wegner touched up the imagery a bit, speeding up the frame rate and doing some color balancing. But for the most part what you’re seeing here is what the spacecraft itself saw as it orbited the Moon. And it’s so beautiful! The lunar surface is so rugged and barren, yet capable of astonishment. There’s so much of it! I didn’t recognize any features until the Tsiolkovsky crater swung in to view at the 1:14 mark, its floor covered in dark basalt like the maria. But for all the beauty, it’s the Earth that captures our imagination in these views. It’s far brighter than the Moon, reflecting four or more times as much sunlight as the Moon’s surface. 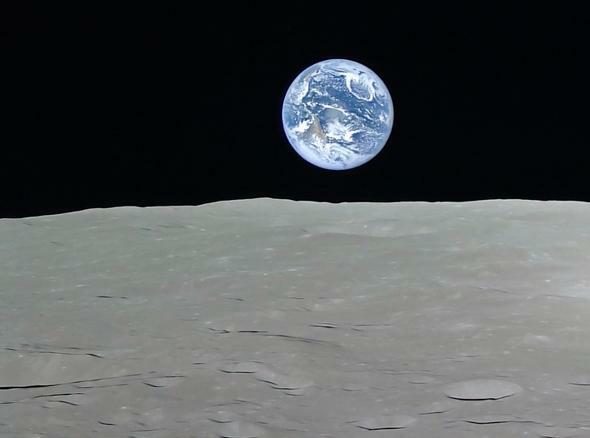 And the color … while the Moon is dull and gray, the Earth positively radiates blue and white. My heart aches seeing how familiar it looks over that unfamiliar rocky moonscape. … but then the end of the video shows the crescent Earth setting and rising, with the glare of the Sun swamping the scene, flooding it with light. That thin crescent may be home, but its phase reminds us that it’s a planet, a world floating in space just like countless others. There a great many benefits to exploring space, have no doubt. But perhaps the most important, the one reason we must do it, is that it maintains our perspective. It forces us to see our planet and ourselves from literally a different angle, and shows us just how small we are, and how great we can be.